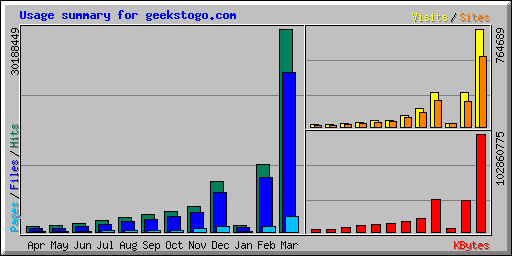 Here are the site statistics for March 2005. The graph below is skewed for a couple reasons. First a 2GB stat file filled up too fast, so the stats stopped recording, also there was a security threat with one of the stat programs for a time, so they were disabled. Because of this, the stats weren't working for most of Jan, and about half of Feb. So, if you double the Feb column, use Feb for Jan, you'd get a pretty good picture of the trend. The month of March 2005 had 550,419 Unique visitors, 2,324,937 page views, and 102GB of bandwidth served. This week we're averaging about 33K uniques, and about 100K page views. Extending that out for a month equals 990K uniques, and 3.3 mil page views. No signs of this growth slowing. Our traffic has been growing about 50% per month now for over a year. With this projected growth rate we'll likely need to add another database server soon, so we can keep the fast site speed that we're all accustomed too. Thanks to all the staff members and volunteers that make this site possible. It's success is due to your efforts.